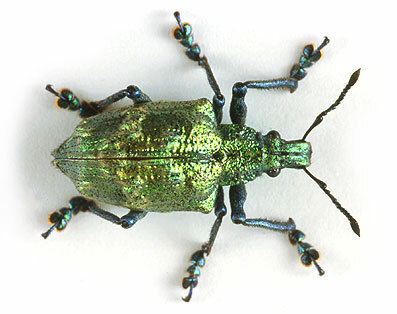 The proverb admonishes, “Look to the ant, thou sluggard, consider her ways and be wise.” The same sentiment can be applied to another member of the Insecta class, a green iridescent Brazilian beetle with the unwieldy moniker of Lamprocyphus augustus. Just by doing what comes naturally, this inch-long weevil has accomplished a task that to date has eluded the Hominidae class's best researchers: the evolution of a structure considered as the ideal architecture for the long-sought-after photonic crystal. To produce ultrafast optical computers, it is first necessary to produce an ideal photonic crystal that will enable exacting manipulation of light. Currently, light in near-infrared and visible wavelengths carries data and communications through fiber-optic cables, but this photonic information must be converted back to electrons before it can be processed by a computer.